The Snake Creek Chalet at Brighton Ski Resort is the ultimate ski-in/ski-out property or summer retreat. It's all about the mountain lifestyle! Enjoy life to the fullest at this fantastic luxury mountain home restored in 2010 and located right on the slopes below the Majestic chair lift at Brighton Ski Resort in Big Cottonwood Canyon. During the winter, complimentary snow machine ride to/from property for guests, luggage and provisions when you arrive and depart. During the winter, a snow machine ride to/from property can be arranged for an extra charge for guests when you arrive and depart. NO VEHICLE ACCESS IN WINTER - SKI IN/OUT ONLY. 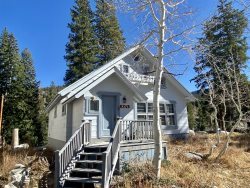 Easy ski in/out access and only a short 10 minute hike up from the parking lot provided for your vehicles. Sleeps 12 adults easily in six different bedrooms with 3.5 bathrooms - nearly 4,000 square feet of a true mountain chalet experience. Start creating memories that will last a lifetime while skiing, snowboarding, hiking, mountain biking and bird watching right out your front door. This well planned layout has room for everyone including a great room with spectacular vaulted ceilings, soaring light filled windows, spacious luxury kitchen, loads of bedrooms and even a hide-a-way playroom on the upper level. Each bedroom has been decorated with care to create a special experience. The master bedroom looks right on to the slopes! Other visiting guests have described Snake Creek Chalet is like a unicorn, as there is nothing else like it at Brighton. All the comforts of a luxury home, positioned in center of the ski resort, yet secluded in a private setting surrounded by 100 foot trees. Brighton Ski Resort is a unique resort offering access for all skier/snowboarder types and levels, high speed lifts running day and night, and small town ski resort experience.